today I want to share some photos of our beautiful garden. I am so lucky to have married a guy with a green thumb. he makes every corner of yard look pretty. this spring we put in new raised beds since our old ones were falling apart. You can see some photos of this project here. Our new raised beds have provided us with many a meal already. Remember that Kale salad recipe? Last night we enjoyed the last of the Kale crop. I had never made Kale chips before though I saw recipes posted all over the Internet. All I did is wash the leaves, remove the stems, toss the greens in olive oil, sprinkle some pepper and salt on, baked them in the oven for about 15 minutes on 350 degrees in the oven. Wow. They are as good as they say! Zucchinis galore. The kids love to make zucchini brownies or muffins. Last week I made a zucchini pesto soup to die for. Brushed with olive oil and baked in the oven, they make for a great side dish. But those zucchini keep coming at us. It's funny when you miss to pick one - out in that green jungle of leaves. Hubby found one yesterday and remarked how it rising out of the bed like a giant green blimp. Perfect image. What to do with all that bounty of zucchini? I think we will take some over to the local shelter today. They are always looking for donations of food. Next are the tomatoes. Finally! We never buy fresh tomatoes from the store.Those hard round waxy tasteless globes at the store do not deserve the name tomato. Instead we have decided to live on the memory. For 9 months we have lived in anticipation of the most scrumptious fresh ripe fruit a gardener can grow. We had pizza magherita twice this week. Tomatoes with mozzarella and fresh basil sprinkled on about every other day. And then the kids just eat and eat the tomatoes fresh from the vine as they walk by. It's been a feast for about two weeks now. We have grazed on fresh herbs like cattle on a pasture. Picking fresh dill and basil and throwing it in any dish you can think of. And the master gardener didn't forget to sprinkle in some flower seeds amongst the food. Because we don't just live through our stomachs. 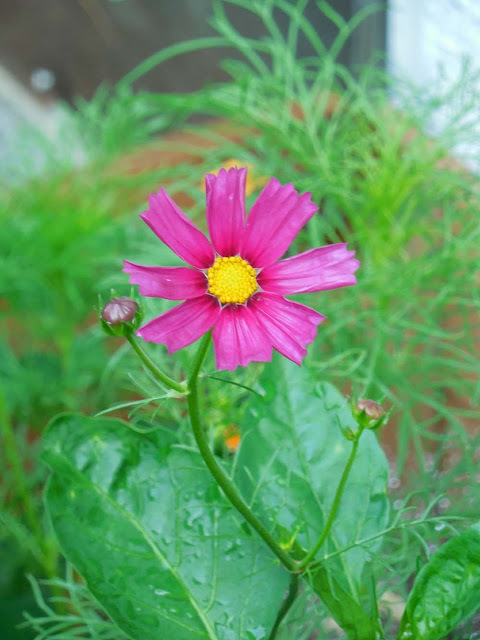 The eyes get to feast on bright colored cosmos and hibiscus growing in and around our raised beds. I love our garden, and I am filled with gratitude that we are able to have it. The paint on our house may be peeling, and we may have slipped a little deeper into debt this summer because our fridge died and we had to buy a new one. But I can't help it but feel rich and happy when I look at those green luscious garden beds.